Govindjee, who uses only one name, was born on October 24, 1932, at Allahabad, Uttar Pradesh (U.P.) India; he was married to Rajni Varma on October 24, 1957, at Urbana, Illinois, USA; they have two children: Anita and Sanjay; he was naturalized to be a citizen of the USA in 1972. Rajni, Anita and Sanjay use "Govindjee" as their last names. His departmental friends call him "Gov". In 2018, Govindjee decided to officially change his name to "Govindjee Govindjee", and, thus, he travels by that name now. However, he continues to publish under one name only, although it means that most internet programs continue to delete his name totally from his publications! 2000 Spring: Visiting Professor of Biology, Washington University, St. Louis, Mo. 1992: Invited "Personal Essay" in "Plant Physiology" text by F.B. Salisbury and C.W. Ross, Wadsworth Pub. Co., pp. 222- 224. 1995: "Notable 20th century scientists", E.J. McMurray, editor, Gale Research, Inc..
2014, 2017: Govindjee was recognized for his teaching of Z-Scheme of photosynthesis, both outdoors and indoors; see: Mohapatra and Singh, Photosynthesis Research 123: 105-114 (2014); and Jaiswal, Bansal, Roy, Bharati and Padhi, Photosynthesis Research 131, 351-359 (2017). "Govindjee's passion for photosynthesis has been inspirational for students and researchers for over 50 years. At the start of his 80th year, this volume of the Advances of Photosynthesis and Respiration series is dedicated to Govindjee to especially acknowledge not only his unique discoveries in Photosystem II, but also his commitment to educating students and researchers throughout the World." In the same vein, the Dedication added" His unparalleled commitment and knowledge have made him a true advocate, and ambassador, of photosynthetic research and education around the World." 2013: Volumes 116 and 117 of Photosynthesis Research were dedicated to Govindjee’s 80th birthday, by Suleyman Allakhverdiev (of Russia), Jian-Ren Shen (of Japan) and Gerald (Gerry) Edward (of USA); Julian Eaton_Rye wrote a special article (Photosynthesis Research 116: 111-144); this was followed by an article by Ondre Prasil (Photosynthesis Research 122: 113-117. Former Member, Executive Committee of the International Society for Photosynthesis Research (ISPR); and of the "Publication Committee" of ISPR. Former Member, Standing Advisory Committee (Overseas) (SAC(O)) of the Department of Biotechnolgy, Government of India, New Delhi, India. Served on several Editorial Boards: Comments on Molecular and Cellular Biophysics (U.S.A.) ; National Academy of Science Letters (India) ; Plant Biochemical and Physiological Journal (India); Photosynthesis Research, The Netherlands (served as Associate Editor; Editor-in Chief; now a Member of the Editorial Board). Govindjee has taught at both the undergraduate and the graduate levels from a class of 700 students to as few as 6. Topics of lectures included: biophysics; photobiology; plant physiology; plant ecology and organismic biology; photosynthesis; and bioenergetics of photosynthesis. He was ranked as an outstanding/excellent teacher by both his undergraduate and graduate students. 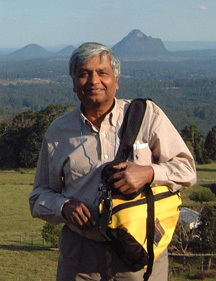 Govindjee has also delivered many public lectures on the basics of photosynthesis, and on the history of photosynthesis. Planned: Govindjee remains interested in teaching "Photosynthesis Through the Internet" to all ages from 10 to 110. This is a long-term, perhaps unattainable and unrealistic, project. He welcomes suggestions from the readers of this web page. Planned: Govindjee is further interested in (1) revising his book "Photosynthesis" (John Wiley, 1969: Link) and making the revised version available free on the Internet, as is the 1969 version; and (2) doing research in the area of "History of Oxygenic Photosynthesis Research, and the Actors Involved". Again, he welcomes suggestions from the readers of this web page. Drs. Patrick Breen, Jean-Marie Briantais*, Christa Critchley, Mrinmoyee Das, Ashish Ghosh*, Adam Gilmore, Ashok Kumar, G. Sarojini, Manfredo Seufferheld and J.J.S. vanRensen. Drs. Elizabeth Gross*, Shmuel Malkin*, Barbara Prezlin; Beazy Sweeney* and Karel Vacek. Drs. Ian Baianu*, Fatima El-Shintinawy, Ralph Gasanov, T. Kambara, Ismael Moya and Teruo Ogawa; and Mr. Jobie Spencer*. For details, click on "Past Graduate Students" on the home page. Pictures of those who attended my retirement party on October 14, 1999, can be seen by clicking here. The first graduate student who worked with him was Carl N. Cederstrand (co-advisor: Eugene Rabinowitch). Alphabetically, other graduate students are: Maarib D.L. Bakri (Bazzaz); Glenn Bedell; Danny Blubaugh; Jiancheng Cao; Y-C Chen (worked with Robert Clegg); Fred Cho*; Ray Chollet (worked with Bill Ogren); Roger Chylla (worked with John Whitmarsh); William (Bill) Coleman; Julian Eaton-Rye; James(Jim) Fenton; Oliver Holub (worked with Robert Clegg); Paul Jursinic; Rita Khanna (Bhattacharya); Anne Krey; Ted Mar; Prasanna Mohanty*; John Munday; George Papageorgiou; Ralph Schooley; Hyunsuk Shim (co-advisor: Peter Debrunner); Sean Padden (worked with Antony Crofts); Paul Spilotro; Alan Stemler; David VanderMeulen; Williem (Wim) Vermaas (completed PhD with Jack van Rensen); Daniel Wong; Thomas (Tom) Wydrzynski*; Jin Xiong; Chun-He Xu; Louisa Yang (Ni); Yan Zhou (worked with Lance Schideman) and Barbara Zilinskas.